I was very busy last Saturday! I had to work my day job that morning, and since I was near so many great places, I went shopping! I went to an Estate sale, several thrift stores, and to Liquadation Warehouse, formally Federated Warehouse. Liquidation Warehouse is located at 1200 West Marshall Street in Richmond, VA in the Heart of Virginia Commonwealth University. Because of its location, they have to move. The building is being demolished here in a few months to build student housing. I'm hoping they find a new location soon! 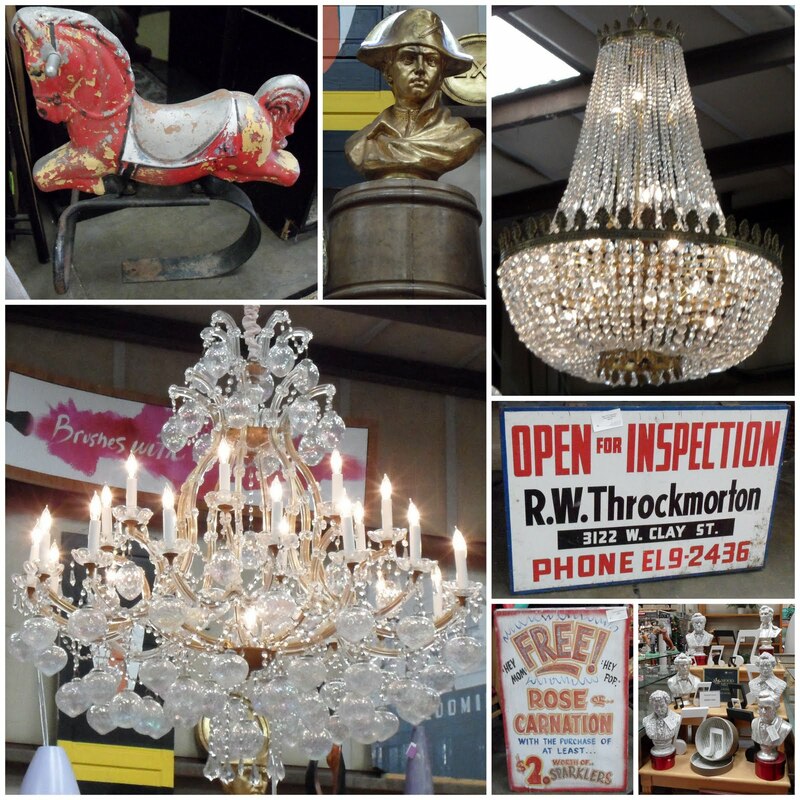 This is one of those AMAZING stores where top designers, set designers, Broadway Producers, and more shop to find over the top and one of a kind fixtures, props, antiques, and home décor! This rocking horse came from an old playground. It would look great in a garden! They have tons of vintage signs. Look at these busts of great composers--they are finished in sheet music! Fancy! They also carry a great selection of chandeliers, both vintage and new. This one is HUGE! Those are 3" & 4" blown glass Christmas ornaments standing in for crystals! If you are opening a shop, this is a great place to go--they have a great selection of fixtures, display cases, shelves, and mannequins. The owners travel the world buying items from movie studios, department stores, and auctions. This bust of Napoleon is nearly eight feet tall! I really hope this place finds a new home soon! It is a favorite place to shop! If you didn't know, my cast iron Gothic style bed came from here about 4 years ago! I'll be back soon with more goodies! I might try to come here again this week-end!